Attending the Mozilla Summit in Toronto? Think that it’s about time for another Summit Series? Register to play or watch the Mozilla Summit hockey game at Maple Leaf Gardens. Limited space for players. Sign up today. TRIBE is a new Mozilla leadership program currently being built by Mozilla’s People team. The purpose of TRIBE is to transform the Mozilla culture by developing leadership skills across the project. (Modest, I know.) The focus of the initial session is on you – knowing your strengths, identifying your reactive tendencies, and understanding the ways in which you listen. I completed TRIBE session 1 this week in Toronto. I have previously taken a good chunk of the IBM leadership and soft skills training course catalog. That is to say, I have a pretty good understanding of how this type of course is typically structured and delivered. (IBM courses are delivered by a number of different vendors.) TRIBE session 1 was something different. After the last two days I am left blown away by the extremely well put together material and delivery of this newly developed course. The initial TRIBE session is a group experience but an individual journey. What I mean by that is that all of the members of this session participate in the same discussions and exercises and all have access to the same course materials. However, as this session focuses on you, your journey will be very personal and not one that will be replicated by anyone else in the program. Your takeaway thoughts and actions will be specific to you. You will succeed by building trusted allies in your course mates, who will equally rely on you for their own success. So, while I cannot tell you exactly what you will get out of this course, judging from the reactions of the people with whom I shared the last two days, I can tell you that this time looking inward will serve you well. The strength finder assessment that you will complete before the course may not make sense to you initially. Don’t judge the strength finder assessment until after you have completed the initial TRIBE session. Before attending the session spend a few minutes thinking about the where you would like your career to be in 2-5 years. Before attending the session jot down the names of a few people who you admire and think would be valuable to you as mentors. When something is well done acknowledgement and thanks are in order. As such, I want to thank Debbie and the People team for developing a truly excellent course offering. I also want to thank Kate Roeske (Red Carrot Leadership) and Athena Katsaros (IdeaTr!be) for doing a wonderful job facilitating our session this week. As the purpose of TRIBE is to transform the Mozilla culture, TRIBE is open to all Mozillians. Course schedule and registration details can be found on the TRIBE wiki page. When: May 22, 6-9pm ET. Mozilla Open Web Open Mic (OWOM) is back for May. Put on by the Mozilla Toronto community, OWOM features a science share exploration and lightening talks (5 min). April’s event had a great turnout (50-60 people) and included a variety of content from WEBVTT, to MakerFaire, to my talk Building for Mobile Web Compatibility. A couple of weeks ago, our friends at Europtimum responded to our horse gesture (timeline) with the delivery of a most excellent Totoro. 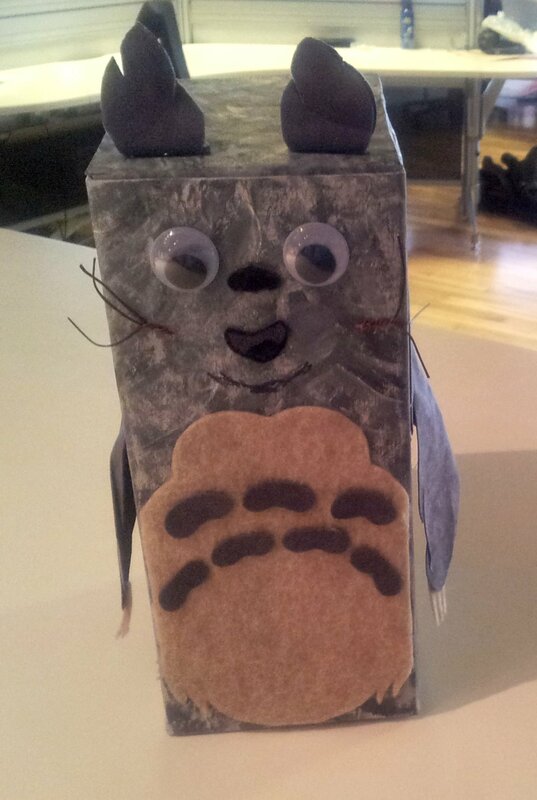 For those of you unfamiliar with Totoro, my understanding is that it is a 1980’s Japanese animated cat. 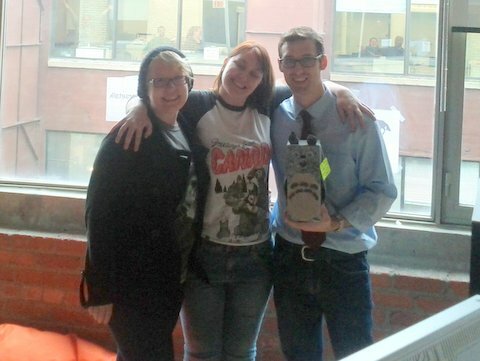 This particular manifestation is a cat like box, which the lovely people over at Europtimum made themselves and filled with an end of week snack consisting of candy necklaces, rockets and super balls. (Despite at least one person having never previously seen a superball, no one ate the superballs.) Needless to say, fun for the whole office. Mozilla and Europtimum have been having a fair amount of fun. However, our initial connection was simply location based – their office is on the fifth floor in the adjacent building. A small act of kindness to brighten the day of our neighbours has resulted in a wonderful series of back and forth with them that has brought smiles to both of our offices. This latest bout of kindness got me thinking that it’s time to take horseplay on the road – that is, to spread the fun to others. Here’s my challenge. Take a look out of your window and pick an office. Figure out who’s over there and then, quite out of the blue, send them a horse related product. (Bonus points for doing it in person!) Let’s see what sort of new relationships will form simply by taking a few minutes out of your day to do something nice for a group of strangers. The horse head that we sent is available on Amazon. Some other fun products might be a lucky horseshoe, a plush animal, or mane and tail. To kick things off and break the international border, the Mozilla Toronto office has sent a horse head to our Mozilla colleagues in France to celebrate their new Paris office. Last Wednesday’s Open Web Open Mic event at the Mozilla Toronto office was really great. 50-60 people from the Mozilla Toronto community gathered to discuss their projects via a science fair and a series of lightening talks. I had a good conversation about WebVTT with a group of Seneca students, learned about the upcoming Mini Maker Faire Toronto from Jenn Dodd, and discussed the use of What Can I Do For Mozilla for non coding work with Josh Matthews. 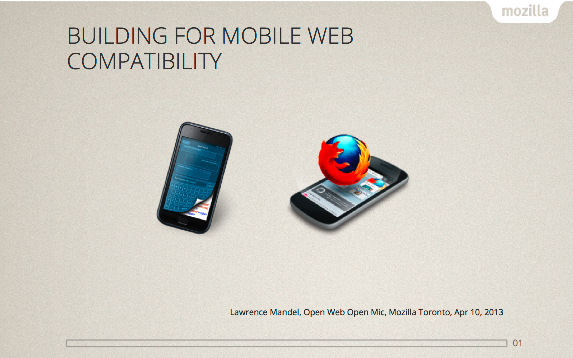 As this was an Open Web event, I took the opportunity to talk about Building for Mobile Web Compatibility. If you would like to see more, I have posted my slides on github.io. Thank you to everyone who came out to this event and especially to Majken ‘Kensie’ Connor for pulling us all together. Who are these managers and what do they do? As the Mozilla project has grown so too has our management structure. There are a number of people with various manager titles involved in the day-to-day operations of many Mozilla projects. You may know some of these people and have a sense of what they do. This post is to help clarify these positions so that you can better understand the value that people in these roles bring to the project and their relationship to your work. There are four types of managers that I will discuss here: development managers, product managers, project/program managers, and release managers. A development manager has responsibility for a development team, such as front-end, WebAPI, or performance. It is the development manager’s responsibility to guide the team’s work, balancing various requirements and the relative priorities. Development managers are people managers. This means that they are responsible for the professional growth of the people on their team and that of the team itself. They serve as reviewers, mentors, and advisers. Many Mozilla development managers are very hands-on writing patches and providing code reviews. Some people you may know in this role are Gavin Sharp, Andrew Overholt, and Taras Glek. Product managers are more removed from day-to-day development. They gather requirements for Mozilla products by reviewing market research and trends, following standards bodies like the W3C, and speaking with the engineering community. They have the challenging job of forecasting the requirements for our products based on their projected market needs 3, 6, 12, or more months into the future. Product managers provide strategic guidance for our development efforts through user and developer stories, use cases, and product roadmaps. They help with tough decisions about feature and product prioritization. Product managers spend their time looking at the big picture to ensure we can all see the forest for the trees. Some people you may know in this role are Asa Dotzler, Karen Rudnitski, and Chris Lee. Project/program managers drive projects by managing project scope, schedule, and risk. They serve as a project steward and sounding board for stakeholder issues. Project managers coordinate work from various teams such as release engineering, product, user experience, support, quality assurance, press and pr, marketing, legal, privacy, WebDev, and IT. The result of working with these teams is that people in this role are typically well connected in the project. Unlike release managers, who, as I will discuss below, focus on individual releases, project managers focus on projects that may span multiple releases or multiple products. Many of the people at Mozilla who are in this role have strong technical backgrounds having come from the development organization at Mozilla or elsewhere. Some people you may know in this role are Sheila Mooney, Caitlin Galimidi, and me. Release managers are similar in many ways to project managers except their focus is on individual Firefox releases. The release management team manages and coordinates release schedules for the Firefox desktop and mobile Release, Beta, Aurora and Nightly trains, as well as Firefox OS. They monitor and control our risk profile and its impact on our product quality. They chase down critical issues and manage chemspill releases (point releases for critical issues). They ensure that the process flows from code check-in, to build, test, and release. They triage and track bugs in current and upcoming releases and coordinate the resolution of external issues, such as those due to plug-ins and add-ons. Release managers have to balance the needs of the various Firefox stakeholders including engineering, release engineering, quality assurance, support, documentation, and IT. Some people you may know in this role are Alex Keybl, Lukas Blakk, and Bhavana Bajaj. If you have worked with people in these manager roles you may have noticed that some people seem to be doing aspects of multiple manager jobs. The descriptions of each role above are the core responsibilities of each group. These roles tend to bleed into one another to a certain extent. All of the people in these roles are leaders within the organization and each have skills that allow them to play multiple roles. Now that you know more about these roles and the people in them, use them. Talk to your product manager if you want to understand more about the product requirements and priorities. Talk to your project manager if you are blocked, unclear about project scope or timeline, or need some other help with your project. Talk to your release manager if you have questions about the upcoming release or have critical work that you think should be brought to their attention. And talk to your development manager about your engineering work and your career.